Last week, I started this series with posts about rewrites in round one, and things like sentence structure and word usage in round two. Now for round three! For round three, I like to focus on the smaller details; things like spelling errors and grammar/punctuation. For this round of editing, I suggest switching up your form of editing. In other words, if you've been editing on a computer, it's time to print out the document. And vice versa! 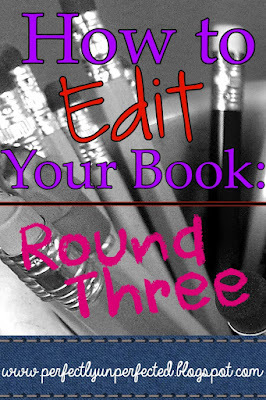 The reason for this is that this round of editing focuses on the tiny things, and by the time you reach this round you've likely read your book at least three times. The words are probably beginning to sound boring and familiar, and you're probably getting sick of your story. I'll say once again that I'm a big believer in taking routine breaks while editing or writing your book. Give yourself about a week of break time (meaning a week of not looking at your book at all) in between editing sessions. After you've changed your method of editing, get ready to be looking for some teeny, tiny errors. One of the biggest problems I've seen with grammar and punctuation isn't necessarily that the writer doesn't know much about grammar, but rather they've just made tiny mistakes with it. Namely, forgetting periods at the ends of sentences, comma splices, and lack of consistency! Obviously, to solve the problem of forgetting periods and other punctuation marks at the ends of sentences is just to look carefully, multiple times. You have to actually look for these kinds of mistakes, otherwise your brain will probably just skip right over them. I love pandas so much, they are the sweetest animals! I love pandas so much. They are the sweetest animals! I love pandas so much; they are the sweetest animals. This is quite possibly one of the hardest types of errors to look for. Obviously if you're using a program like Microsoft Word, it'll underline your misspelled words with a red squiggle. That part is simple. I'm talking about the spelling errors that aren't going to be caught by Word; the ones where you spell something wrong, but it's still a word. Words like to, two, and too, have and halve, no and know, for and four, etc. In this case, I find it's give or take with Word's spell checker. Sometimes it catches these errors, sometimes it doesn't. And when it doesn't, you have to. So look carefully! In the spirit of spelling errors, I thought I'd end this post with one of my favorite funny poems. It was written by Jerrold H. Zar and Mark Eckman. Enjoy, and check back on Thursday for the final post in the series!